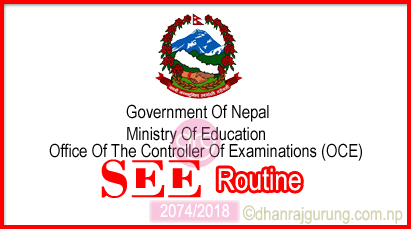 Today 21 December, 2017 (6 Poush, 2074), Government of Nepal, Ministry of Education, Office of the controller of examinations (OCE), Sanothimi, Bhaktapur has published Routine for Secondary Education examination (SEE) Grade 10 routine and this Exam Time Table is for all Regular, Exempted and Grade Increment students. As per the schedule, Grade 10-Secondary Level Education examination will be conducted from Thursday, 8 Chaitra, 2074 (22 March, 2018) and will end on Tuesday, 20 Chaitra, 2074 (3 April, 2018). The examination time for SEE will be from 8 am from 11 am. SEE Examinees will be evaluated under the letter grading system. Download and Check Routine Of SEE in PDF File from the Official Site Of SEE. CLICK HERE. Below is the routine for SEE for the academic year 2074 (2018). 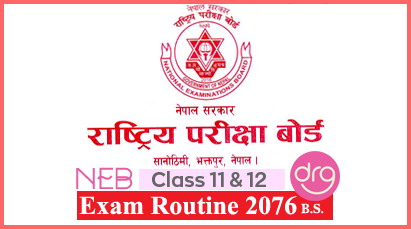 0 Response to "Check SEE Routine 2074  | Exam Starts From 8 Chaitra 2074"